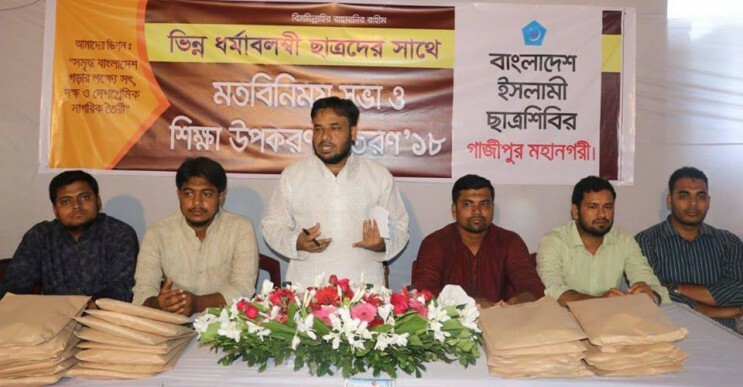 Bangladesh Islami Chhatra Shibir Secretary General Mobarak Hossain said that Islam is a comprehensive system of life. It is applicable not only to Muslims, but for people of all classes, professions and religions. Islam attains its full implementation through its establishment in the state and implementation. The highest standards of safety, rights and respect have been ensured for non-Muslims in the Islamic state system. He said this while addressing a discussion meeting and education seminar with students of other religions organized by Gazipur Metropolitan Chhatra Shibir at an auditorium of Gazipur. Metropolitan President Eng. Mizanur Rahman presided over the function and Secretary Fakhrul Alam Sifat conducted it, in the presence of Metropolitan Office Secretary Zahir Uddin, Finance Secretary Sakir Bin Hossain and Education Secretary Jahangir Alam, among others. The Secretary General said that the security rights and dignity of non-Muslims in the Islamic state system is not merely a matter of religious or theoretical issue. Rather, there is clear evidence and instructions for implementing it in the history of Islam. In the age of the Messenger of Allah, and his righteous Khulafa, the non-Muslims enjoyed civil rights in religion, society, economics and politics just like the Muslims. The responsibility of protecting their lives, wealth, honor and respect and religion was entrusted to the state. They gave freedom to the non-Muslims to practice their own religion and their own cultures. Similarly, during the age of Umar ibn Abdul Aziz (RA), Islam was established as the state system and he ensured full rights for the non-Muslims. There is no lack of such precedents in the history of Islam. But whenever the Muslim rulers had turned away from the welfare model of the Islamic state, turmoil and disorder began. When these rulers ruled the state with their own or man-made doctrines and ideals, they also took away the rights of the Muslims, not just non-Muslims. They botched the complete welfare system of the life of Islam. And this kind of work has denied the dignity of the Muslims as well as deprived people of their rights, which still continues. He said that the current fear and distrust of Islamic rule in the minds of the non-Muslims is because of present day Muslim rulers, who are turning away from the Islamic ideology. These Muslim rulers are holding misguided ideologies and oppressing the people and taking away their rights. The victims are people of all religions. The number of incidents of minorities repression and violation of their rights that have been carried out during the tenure of the current government is unprecedented, according to minority groups representatives. They are not only violating the rights of non-Muslims, but they are also playing the politics of hate against the non-Muslims. On the other hand, they are also maligning those who are trying to establish Islamic state system. They are aging against the Islamic system of life in their desire for power. He also said that a lot of confusion is being spread by the mal-propaganda of state regarding Chhatra Shibir. But from the side Shibir, there has never been such a thing as violence against other religious people, not even denigration. Nobody will be able to give evidence that Shibir verbally fought a person of a different religion. Rather, in Bangladesh, Chhatra Shibir is the only organization that guarded the temple risking their lives throughout the night. Every year, Chhatra Shibir helps needy non-Muslim students from its own resources. Besides, people of all religions are included while helping various victims of natural disasters and accidents. We believe that the minorities need more opportunities to gain benefits. And these rights will be established in full form only when the Islamic state is established. We hope that our non-Muslim friends will aid in Shibir’s journey by not listening to any propaganda and confusion.